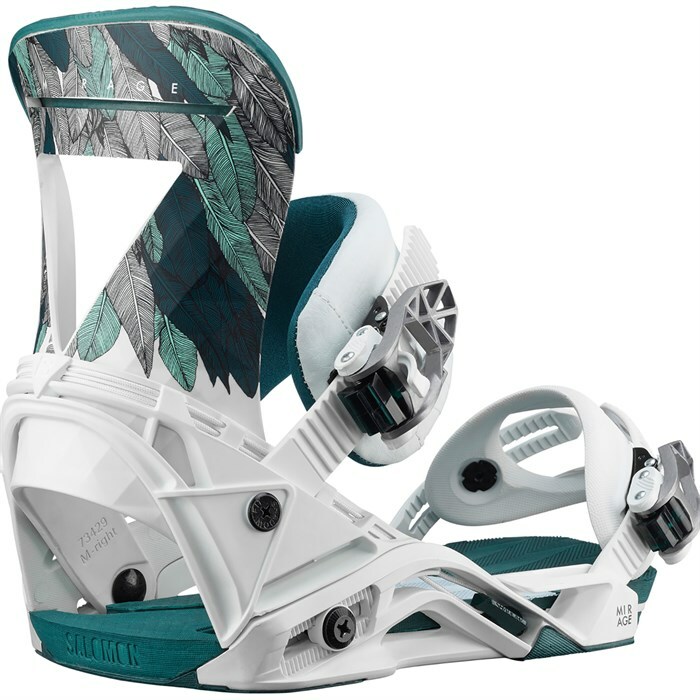 A women's specific freestyle binding that was born to play in the park, the 2019 Salomon Mirage Snowboard Bindings bring an updated highback for smoother lateral movement and a comfortable yet responsive feel. Built upon Salomon s ShadowFit baseplates for the closest possible board-to-binding connection, these binders promise to elevate your experience in the park. It's not an illusion, it's the Salomon Mirage Snowboard Bindings. Medium Flex  A medium flex is adapted to riders that need a binding that can adapt to all terrain types and riding styles. ShadowFit Baseplate | 30% Composite  3-piece baseplate featuring a unique flexible heel loop and completely anatomical fit to provide intuitive mobility without sacrificing performance. The result is an ultra light binding that allows your whole kit to flex together. Adjustable Toe Ramp  Super easy to handle adjustability for the best possible transmission on toe edge. Integrated Mounting System (IMS)  IMS is a Salomon patented technology that keeps your disc screws in place while adjusting your binding angle or swapping out boards. You'll never drop a screw in the snow again. Universal Disc  Ultimate compatibility with all existing mounting systems on the market. Power Hook  Provides optimal strength, support, and energy transmission for initiating turns or loading up for ollies. Kevlar Quickwire  For maximum support and quick transmission of any movement. Canted Footbeds  Instantly add pop, power and extra edge control to your riding with a 2.5° canted footbed. Easy on the knees and no loss of board-feel. Mirage Highback  The Mirage's women's specific geometry is slightly lower, to create a comfortable environment for a woman's calf muscle without sacrificing the support you need to power through turns. Women's Cut  Slightly lower geometry to create a comfortable environment for a woman's calf without sacrificing the support you need to power through turns. 3D Asym Supreme Ankle Strap  Asymetrical shape to increase the support on the outside and tweakability on the inside while keeping a perfect anatomical shape to prevent any pressure points for all day comfort with no compromise in performance. Women's Specific Geometry  Custom designed to fit women's specific boot shapes, this 3D strap padded with Autofit tightly hugs your ankle no matter what the position. Lock-In Deluxe Toe Strap  All the hold of the Lock-In toe strap with extra comfort. MicroMax Strap Adjustments  Fast and precise micro adjustments let you optimize the straps centering on your boot for maximum comfort and support. MP Ratchet  Highest performing and quality ratchet found on all Shadow Fit bindings. Better tightening, less ladder damage, more power and precision with each click.